You probably thought I'd review Jurassic World today. My parents came in for the weekend so we didn't see it. I will be seeing it this weekend! In the post Photoshop Project: Map Making, I showed you the fantasy map I was designing. 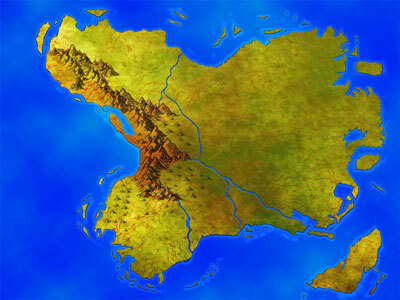 To recap, I usually make fairly flat maps. I love how they come out. As as experiment, I wanted to try making different terrains. I needed to study other fantasy maps. To Pinterest! The forest gave me some trouble. I played with different greens to find one that didn't scream at you. Like mountains, trees are a brush tool. Laying down the trees in a way that looked good took some time. Creating different terrains means creating a lot of layers. 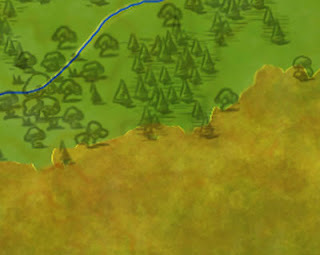 I select a portion of the land, copy it to create a new layer and leave it where it is. 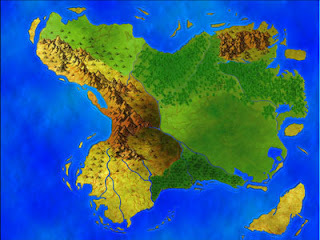 The green is not a part of the main landmass. It's on top of it. Because it's on top of the land, we get a noticeable line. A bit too noticeable for my liking. I used the blur tool to make the forest line flatter. This was a nitpicky thing because you can't see the above line from a distance. 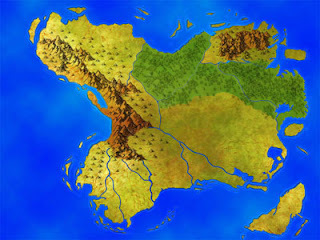 The maps I studied use different shades of green. Transparent gradients and textures were my friends. 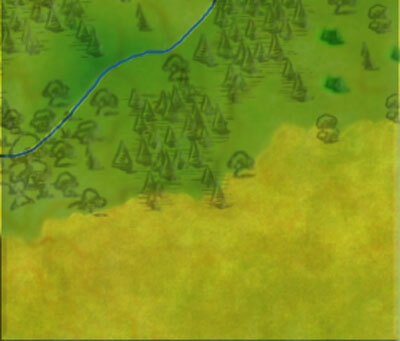 I played with gradients so the forest wouldn't be flat. I wanted some darker green in there. I wanted the actual trees to be more noticeable. This is a combination of changing the colors and playing with other Blending Options for the land and the tree layers. I wasn't sold on that hole in the middle. I added more trees. By accident, they came out brown. I really liked it. So, now what? It's done. We have a map. To make this process even more fun, I added names. 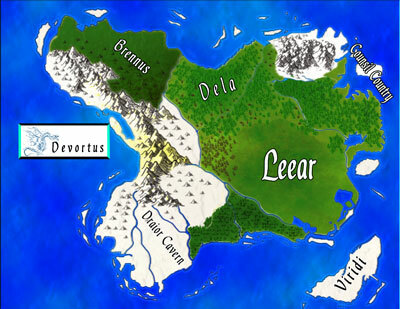 To go a step further, I turned this into a map for my upcoming novella Devortus Reigns. The land, Devortus, has some ice. The inhabits, Brevia, prefer the cold. The land needs some white. This map is still just for fun. I guess it could be Devortus, but I didn't go into this project with that intention. I haven't made up my mind yet. It would be cool to have this with my novella since shorter books don't usually come with maps. 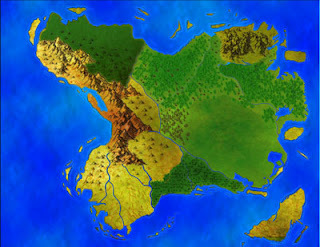 Well, I've never come across a fantasy novella with a map. This process was fun. I enjoy doing stuff like anyway. I'm really happy with the results. Devortus Reigns was missing some place names. The map made me assign names to those areas. 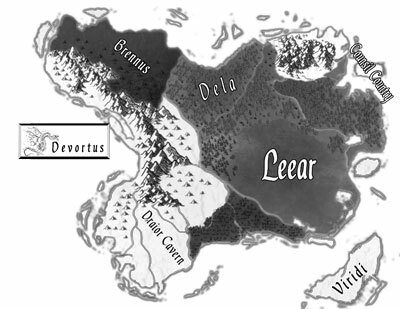 Since this map could go in a book, it needs to be grey. How does it look without color?